This bike has a NuVinci Nfinity N330 hub features a continuous variable transmission or CVT, which sits along the back wheel and it transitions from least to most efficient with a twist of the knob on your right hand rather than shift through gears. Shifting, moreover, couldn’t be smoother and can be done when at a standstill or while pedaling. Waiting for the gear to catch or transition is not an issue, which means you can transition quickly on the up and downhills to save energy and gain speed again. The indicator along the right transitions guides and provides you with helpful updates and tips on how to better handle your transition. More specifically, when there is a sharp hill icon, that means you are on the easiest gear. However, as you transition to add more resistance, the icon becomes more flat. 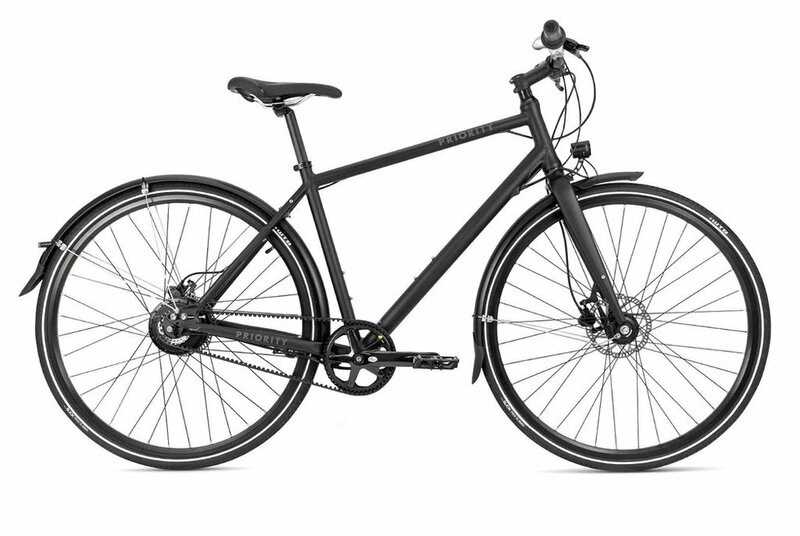 The Priority Continuum Onyx comes with Tektro hydraulic disc brakes. They are quick, responsive and overall very reliable. Furthermore, the 360 degree visibility contributes towards this bike’s excellence and thought out safety and security features. There are reflective decals and accents on the front and side of the bike and traditional reflectors are installed on the front handlebars and along the seat post. The tire sidewalls also feature a highlight strip that lights up with when light is pointed towards it. Priority also comes with a 1000 lumen front headlight that can be easily installed to your handlebar or on your helmet.. This light can be purchased as an accessory and comes with a 2nd rear micro-USB rechargeable rear light for $60. Alternatively, you can purchase the light as part of the winter package, which includes studded snow tires for $130. Priority Bicycles really take customization seriously and makes it easy and quick to add and improve onto your bicycle. Priority also includes a waterproof rear USB re-chargeable light which comes with 4 built in modes: constant, slow, fast flash as well as a strobe setting added for visibility from behind. In the front of the bike there is dynamo hub which is an energy-generating hub built into the front wheel of the bicycle that powers the light that is mounted just above the front fender. The light turns while the wheel is turning and was designed to provide visibility day and night. In terms of comfort and performance, the riding position of the Continuum Onyx feel very much like a mountain bike but longer rides should not be discouraged as comfort is not something this bike lacks. The seat is also quite standard with a little padding and has plenty of adjustment room. The Priority Continuum Onyx comes with lightweight fenders that match the bike perfectly. The rear fender is particularly helpful to avoid mud stripes or splashes. More generally, this bike is a great choice for any kind of ride, from the adventurous to the most mundane ones. It is now available for the stunning amount of $1000.